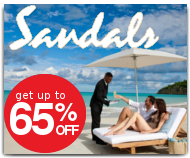 Whether you know a little or a lot about Sandals all inclusive resorts our experts can help. We’ll tell you what is and is not included, which Sandals Resort is best for a honeymoon, how Sandals compares vs other resorts, what a butler does and whether you should upgrade your room at Sandals. 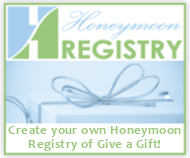 We will help you plan a free destination wedding for two or the whole gang. We’ll even tell you when you shouldn’t choose a Sandals vacation and might be happier with another destination like Tahiti or Fiji. Totem Travel is Sandals’ top travel agency in the west, we’ve been to all the resorts, go back every year and stay in entry level rooms and top of the line butler suites. 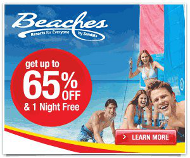 So call, email our certified Sandals Resort specialists, check the latest specials or book online. You’ll get exactly the same price and lowest price available. Guaranteed! 16 resorts on 7 tropical islands – Sandals Resorts are located throughout the Caribbean including Jamaica, St Lucia, the Bahamas, Antigua, Exuma, Grenada and Barbados. Check out our review of Sandals La Source in Grenada, World Travel Award winner of best all-inclusive resort, or Sandals newest resort in Barbados with the Caribbean’s first rooftop infinity pool. Couples only, adults only – Every Sandals Resort is for couples only and no one under 18 is allowed. So the focus is on romance with king beds in every room, candlelit tables for two and intimate spaces that provide the opportunity to reconnect and revitalize. But that doesn’t mean boring! You’ll also find lively swim up bars, hoppin’ night spots and activities day and night. All at no extra cost. What’s included? Sandals Resorts are ultra all inclusive which means gourmet meals, drinks (alcoholic and non), activities and entertainment is included. Non motorized watersports like kayaking, sailing, water trikes and stand up paddle boards are included. Motorized watersports like snorkel trips, waterskiing, wake boarding and scuba diving are also free and you’ll find golf with complimentary greens fees at select Sandals Resorts. Airport transfers are included, WIFI is free at all Sandals Resorts and no tipping is allowed with the exception of butlers and spa therapists. Want more? You got it! Sandals offers fabulous specials year round and these often include spa credits, complimentary off resort activities and air credits. What’s not included? For most guests the only extra cost would be an off resort activity such as ziplining or swimming with dolphins, a spa treatment such as a massage or wrap (hot and cold plunge, steam, sauna and Jacuzzi are free) and shopping. Some guests will pay for premium wines by the bottle but the house pour is Mondavi and there are 4-6 varieties and unlimited champagne free for the asking. Optional services such as a private beach dinner or photo session can make a romantic vacation, honeymoon or anniversary extra special and these extras can be arranged as a surprise if you wish so please ask for suggestions and we’ll do the rest! Accommodations at Sandals Resorts include Standard Rooms, Club Level rooms and Butler Suites. Entry level rooms are normally garden view and offer all the amenities you’d find at a first class hotel including king bed, sitting area, A/C, safe, mini fridge stocked with wine, beer, water, soft drinks and juices. Club level rooms add liquor and mixers to the stocked in room bar. These rooms also have bathrobes, room service and many have ocean views or beachfront locations. Guests in Club level rooms also have a dedicated lounge and the services of a concierge to assist with restaurant reservations and activities. The sky is the limit in a Sandals butler suite which feature private plunge pools and jacuzzis, swim up river suites, rondovals, 2 story beachfront villas, the best locations and views, private dining and a dedicated butler to see to your every whim. Not sure if Sandals butler service is for you? As a top selling butler agency we can help answer that question and even suggest ways to have a butler for the day if just a little pampering is all you crave. Dining – All Sandals Resorts offer a wide variety of restaurants ranging from elegant white glove dining to a signature steak house and authentic English pub. You’ll find lobster, steak, sushi, jerk chicken and pork with all the trimmings, Italian, French, Asian, Mediterranean, Indian and Caribbean restaurants. Even wood fired pizza and a patisserie for your favorite coffee drinks, fabulous pastries and decadent desserts. Plus there are theme nights like a weekly beach party with steel drum band and late night chocolate buffet. Guests with restricted diets will find ample options ranging from gluten free menu items to vegetarian dishes and more and it’s all all included! Weddings – If you’ve dreamed of being married on the beach or under a gazebo draped with tropical flowers, Sandals offers a free wedding package complete with officiate, bouquet, boutonniere, cake, champagne and music! You can customize every aspect of your wedding from cake to color, flowers, photography, music and more and if family and friends can join you we’ll arrange a Destination Wedding with everyone in attendance. You can even get free rooms with a Destination Wedding group but a word of caution – this is one time you shouldn’t book online, so please make your reservations with one of our Sandals Wedding Specialists. Which Sandals is best and when is another resort like Excellence, Secrets or Couples a better choice? We’ve written ots of blog posts that answer these questions and more. Our specialists have been to all the resorts and as a Preferred Sandals Agency our clients receive preferred treatment. So call with your questions, work with a Sandals Specialist or book online. You’ll get exactly the same price and the lowest price available.